Turns out dolphins make for far more than good children's movie protagonists. Brien Aho/U.S. Navy/Getty ImagesHefi, a bottlenose dolphin, receives a routine medical evaluation on the well deck aboard USS Gunston Hall. The Cold War took paranoia and human ingenuity to new heights — so much so that at the conflict’s 1960s peak the U.S. Navy looked to dolphins to beat the Commies. Indeed, over the course of the Cold War the Navy captured live dolphins to train for military purposes, and they’re still around today. In fact, as you read this, dolphins are currently patrolling the waters outside a Seattle-area submarine base, which is home to a huge stockpile of nuclear warheads. The U.S. isn’t alone in its military dolphin possession, however. Russia has them as well, possibly along with Iran and Israel (if you believe Hamas). Still, the U.S. Navy is the world’s only military force that has been open about training dolphins. But just what is the U.S. Navy doing with these creatures? The Navy first discovered dolphins’ bomb-seeking utility when researchers studied Notty, a female Pacific white-sided dolphin and the first dolphin in the Navy’s Marine Mammal Program, in 1960. Initially, the Navy intended to study dolphins’ bodies and swimming styles in order to develop a faster torpedo with less drag, but it soon changed its focus to training covert dolphins in mine detection. Using their forehead melons, dolphins can listen to how emitted sounds bounce back, which allows them to analyze their surroundings instantly. According to a Navy Marine Mammal Program spokesperson who discussed the matter with National Geographic, dolphins don’t just know that they’re swimming toward a piece of metal, they even know what sort of metal they’re swimming toward, making them especially talented at finding underwater mines. In practice, it works like this: When the dolphins find a mine, they quickly return to their trainers, who give the dolphins a flag attached to a rope to put next to the mine. If the dolphins are on guard duty, they will approach enemy divers from behind and clamp a device onto their air tank. This device connects to a floating buoy that explodes above water, alerting the dolphin’s handlers to both the intruder’s presence and location. The Navy has made great use of their trained dolphins across time. For example, five dolphins guarded an Army ammunition pier in Vietnam’s Cam Ranh Bay for two full years in the 1970s. The following decade, the Navy deployed the animals to protect the Third Fleet flagship anchored in Manama Harbor during the Iran-Iraq War. In 1996, the Navy enlisted the dolphins to thwart a bomb scare during the Republican Presidential Convention in San Diego. 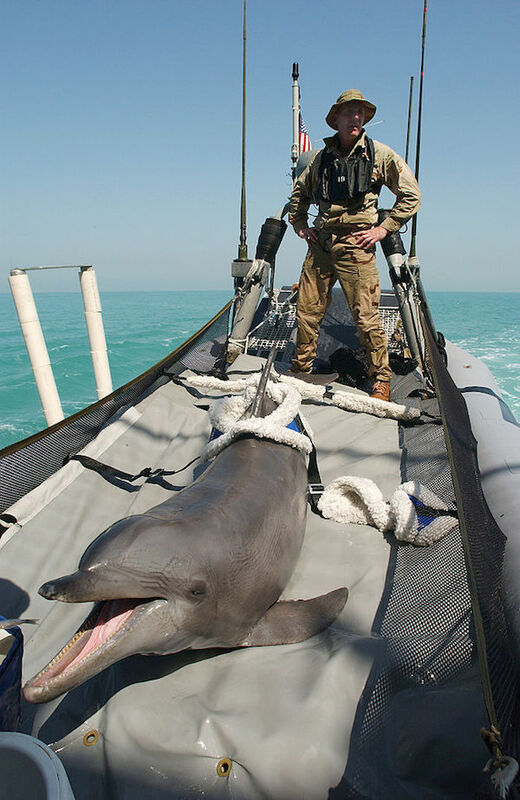 In 2003, dolphins returned to Iraq in order to clear mines in the path of Navy vessels supporting the U.S.-led invasion of Iraq. To this day, the U.S. Navy loves its sea mammals, whether they be dolphins, sea lions, or belugas. In fact, the Navy Marine Mammal Program at the Space and Naval Warfare Systems Command (SPAWAR) in San Diego, California currently has 50 sea lions and 85 dolphins, according to Business Insider, who spoke to SPAWAR in 2015. The Navy has put its money where its mouth is, too. 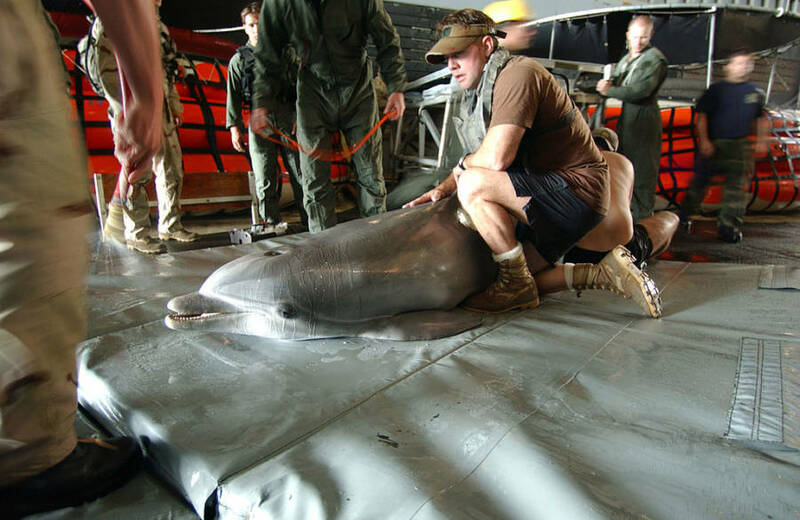 In 2002, NBC reported that the Navy Marine Mammal Program received $14 million in funding a year, and had the Pentagon’s backing through 2020. 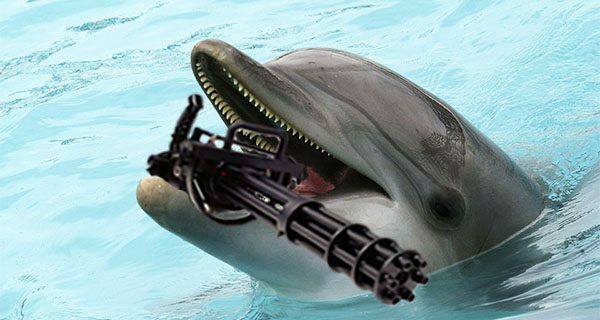 However, more recent reports confirm that militarized dolphins are being phased out starting 2017 in favor of underwater drones, which don’t require constant upkeep and costly care. Don’t tell that to the Russians, though. They just bought five military dolphins.